Dakota discovered the Shoal’s dark and dangerous secret, and now she works toward stopping not only the spread of this knowledge, but also the onset of the nova war. Found adrift near a Bandati colony world far away from Consortium space, Dakota and Corso find themselves the Bandati’s prisoners, and it rapidly becomes clear to them that the humanity’s limited knowledge of the rest of the galaxy, filtered through the Shoal, is direly inaccurate. The Shoal have been fighting a frontier war with a rival species, the Emissaries, with their own FTL technology for more than 15,000 years. 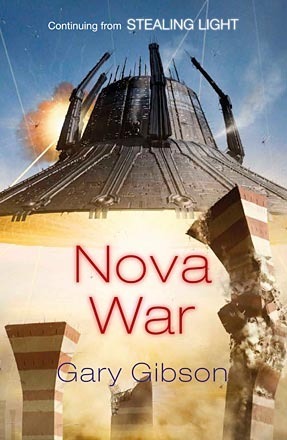 Realizing that the Shoal may be the Galaxy’s one chance at sustained peace, Dakota is forced to work with Trader to prevent the spread of deadly knowledge carried onboard the Magi ships—but it seems that the nova war is inevitable. Continuing from Stealing Light, this book opens with Dakota and Corso in the clutches of the Bandati, being tortured for information relating to the Magi ship they arrived on. Communication barriers and misunderstandings relating to differing physiologies mean that the whole experience ends up being far worse for the humans than, one feels, the Bandati originally intended. At least, that’s what one’s given to believe at at least one point of the narrative. One soon learns that two major Bandati Hives are at war – or at least, at daggers drawn – over something they discovered many thousands of years previously. It soon becomes apparent that what they have found is a Magi ship very similar to the one Dakota and Corso arrived in-system on. Soon enough, Dakota is taken by one Hive, and Corso by the other, and they must work together to prevent either Hive getting their hands on the prize. Throw into the mix Hugh, a dangerous psychopath who is definitely not what he appears to be AND is very much alive, Trader of the Shoal, and a few other power players, and one’s in for another rollicking ride that spans star systems and galaxies. I love Gary Gibson’s writing. It really became clear to me reading this book that here is a writer with true skill. What I love so much is that, while a single scene may take up many pages, that scene is rarely boring. Gary doesn’t pause to describe the scenery, or really to go into too much detail, but every word he uses creates a vision in the mind’s eye that sticks. Even without using all the deep POV techniques that many authors employ these days, Gibson locates the reader right there in the action, with the sights, sounds and smells. I rarely have difficulty imagining the scenery, the finer details that surround the characters. A wonderful vision of the far future.